Cuban tourism authorities have just held the country’s annual tourism show in a venue that’s a showcase for the very type of vacation experience that’s at the cornerstone of the country’s tourist trade. FITCuba was this year held in Cayo Santa Maria, found off Cuba’s northern coast, and one of several previously uninhabited islands the Cuban government developed for tourism. “We have chosen Cayo Santa Maria as the seat of this, the most important tourism event in the country, a destination that is internationally recognized for the beauty of its natural environment, which has extensive beaches of fine white sand that cover more than 10 km in length, with crystalline waters of surprising blue-green tones, surrounded by a hotel infrastructure harmoniously integrated to the environment that have turned it into one of the three main tourist [spots] in the country,” tourism minister Manuel Marrero told those on hand for the early May show. 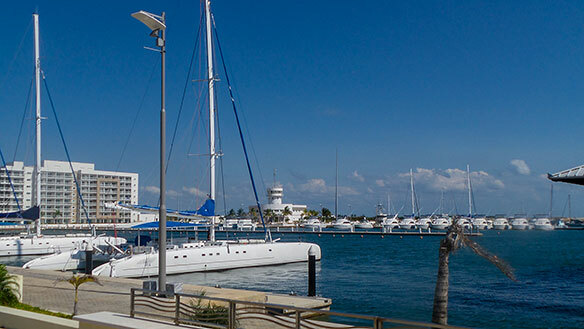 Marrero said Cayo Santa Maria and nearby Cayo Las Brujas and Cayo Ensenachos “have it all” for tourists – 10,545 hotel rooms a dolphinarium, bowling alleys, restaurants, bars, shops, marinas, and four commercial plazas. The “nature-friendly” islands also have their own airport and generate their own electricity. More hotel rooms are in the works for the Latin country, with plans calling for 4,825 to be added this year alone. Havana and Varadero are among destinations that will see hotel openings this year. Cuba last year hosted 4,689,894 visitors, a record despite parts of the country being battered by Hurricane Irma last fall and moves by the United States government to restrict American travel to Cuba. Some 619,777 Americans visited Cuba last year, despite the US government enacting moves that make American travel to the island more difficult. Marrero reported that some 17 companies are now sending cruise ships to Cuba, with Cuba’s cruise trade 28.6% higher in the first quarter of this year than it was at the same time last year. The tourism minister also said that Cuba’s “rich culture, history, tradition, heritage, and society” distinguish it from other Caribbean destinations. Meanwhile, Marrero reported that different aspects of Cuban tourism were lauded internationally by the likes of TripAdvisor and others. Among other things, 21 Cuban hotels received TripAdvisor Certificates of Excellence last year. Next year’s FITCuba show will be held in Havana.